The software EcmWin is written objectorientated in the programming language C++. The user interface is Windows™ standard and offers optimal ease of use. Due to the utilization of standardized dialogs the user finds an easy way of handling. The online help offers corresponding comments to all dialogs. A shorthand help in the footer gives actual references. 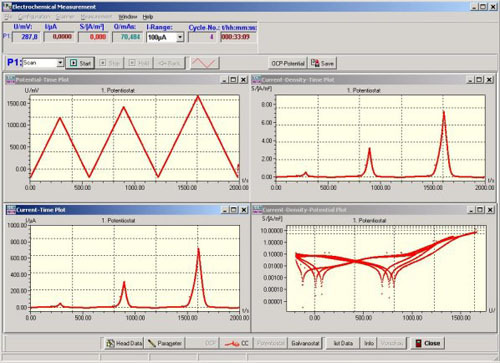 The scanner software allows to assemble the course of polarization of random pitch lines with random durations. This course can be saved with a filename on the harddisk. During the measurement programmed functions are displayed in the smallest kind of increment. Every pitch line is calculated with the values of two sequenced line entries. The dialog of the definition of a pitch line allows the entry of values in different modes. That is how a pitch line over the start potential, the end potential and end time can be defined. Then the polarization speed rate is calculated. In the box Calculate it has to be set which value should be calculated. The corresponding field is deactivated with the result that no input errors can happen. Futhermore the polarization direction has to be set. The standard measurements is centrally executed by a measuring dialog. That is how the desired function is set by a pulldown menu. According to the selection the programming functions are displayed to set up the polarization. All measuring values are displayed on a digital display with the current unit. If the current range of the potentiostat is switched then the dimension of the current will be updated immediately. To normalize the potential a reference electrode correction value can be entered, to calculate the current density the sample size can be entered. Additional to the digital display the measuring values are displayed graphically in different scales. The user can extend the desired scale and scale the others down. The operating modes Open corrosion potential / I-cell and potentiostat / galvanostat can be switched directly. In case of automatic procedures the program sets them up. The four windows with the graphical output of the measurement adjust themselves in the frame of the main window Electrochemical Measurement. They can be enlarged or scaled-down. In the main menu select the Windows tab and choose single window, consistent or overlapping representation. Even a single window can be put in the main frame with the result that the others can not be seen. Every polarization can previously and afterwards be completed with a resting potential measurement. In this way the condition of the sample can be registered before / after. When measuring the open corrosion potential and a hold experiment the program duration has to be set, when polarizing or pulse measuring the duration is calculated by key data and the polarization speed rate. Every measurement can be cancelled manually by the user. The buttons Start, Stop, Hold and Back function as an interactive sequence control of the measurement. The buttons Head data and parameter function as input of description texts or measuring parameters. The Button Save functions as storage of the measurement, Close as close of all measuring windows. The operating modes potentiostat / galvanostat and open corrosion potential / I-cell can be switched manually. 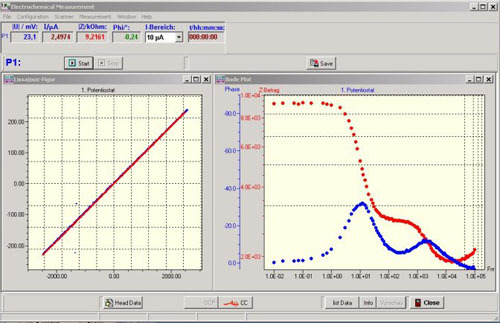 The impedance measurement is an additional module of our software EcmWin. It only works with corresponding potentiostats and external or integrated additional hardware. Like in other function modules we also differentiate among automatic or manual mode. In manual mode the desired frequency can be set up. Sinus signals of current and voltage, the absolute value of the impedance and the phase shifting can be seen on the screen. When the measurement values are valid a button is enabled to apply the measuring point. When the user pushs this button the current measuring point with frequency, phase, U, I, Z absolute value, real and imaginary part of the impedance is saved. Even the measuring point is recorded in the Bode plot window. In automatic mode a file with predefined frequencies is loaded and processed. The program sets up frequencies, measures potential and current, displays the values and calculates the required values. After that the following frequency value is set up.